The Fort Dodge Harmony Brigade has been traveling the “High C’s” for 70 years so what better title for the annual show then “70 Years On The High C’s”. The performance is April 8th at the Fort Dodge Middle School and will not only include the members but three talented quartets from across the United States. It is a cruise of a life time for the Fort Dodge Harmony Brigade as they present “70 Years On The High C’s” on April 8th at the Fort Dodge Middle School located at 800 North 32nd Street in Fort Dodge, Iowa. Performances will be at 2:00 pm and 7:00 pm. The show will take you on the cruise ship USS Harmony as the members get ready to sail on a Hawaiian cruise in celebration of 70 years of barbershop harmony in Fort Dodge. The program is sprinkled with some slap stick humor along with favorite songs such as “It’s A Good Day”, “Shenandoah”, “Beer Barrel Polka”, “Yesterday”, “You’re 16 You’re Beautiful And Your Mine”, “Sweet Caroline”, “What A Wonderful World”, “Jump Shout Boogie”, and so many more favorites. Guest quartets for this year’s program include 2016 Quartet Finalist Quorum, 2016 Quartet Semi Finalist The Newfangled Four and a very special group called Vintage Mix. Quorum is a new and exciting four part A Cappella ensemble. Though their repertoire is primarily in the barbershop style, their collective musical backgrounds in pop, A Cappella, jazz, theatre, and opera combine to give audiences a unique and exciting musical experience. The Newfangled Four is a barbershop quartet out of Southern California and represents the Westminster, Santa Fe Springs, and Las Vegas Chapters of the Barbershop Harmony Society. The quartet recently showed up on Hallmark Channel USA's Home & Family crooning some Valentine's Day classics. Quadruplets and only 16 years old make up the Vintage Mix. The four siblings all enjoy the same music and blend harmony together as only siblings can. Vintage Mix will also be hosting workshops on Friday, April 7th for the High School Students in the morning and then Middle School Students in the afternoon. The workshop will highlight A Cappela and Barbershop singing along with practice and excellent training tips for the youth. 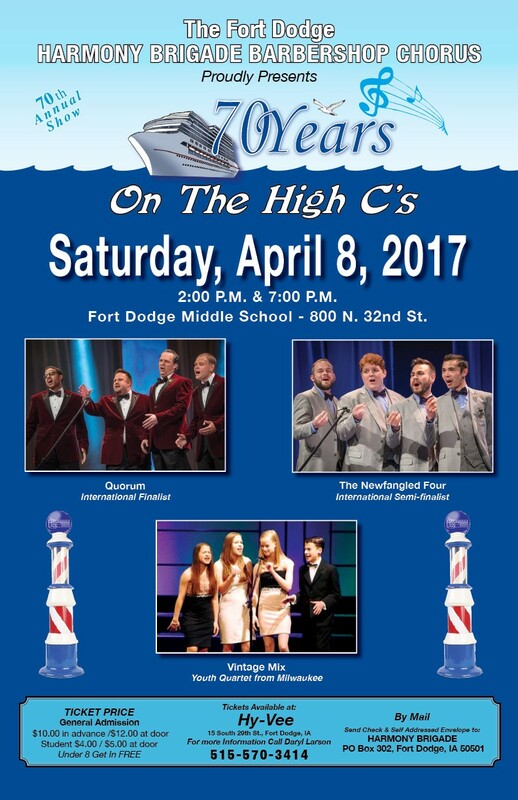 Tickets for the “70 Years On The High C’s” are available from any chorus member, at Hy Vee in Fort Dodge starting March 8th and by mailing your check payable to Harmony Brigade, PO Box 302, Fort Dodge, IA 50501. Ticket costs are adults $10 and at the door $12, students $4 and at the door $5. Children under 8 can attend for free. More information is also available at 515-570-3414. Fort Dodge Harmony Brigade Barbershop Chorus practices each Tuesday evening at the First Presbyterian Church located at 1111 5th Ave N, Fort Dodge and welcomes anyone interested in joining the group. Additional information is available on their Facebook page and at http://www.harmonybrigadefd.com.